My Creative Corner! : Happy Easter! I saved this card for today! We made this card WAY back at the end of January at Terri's FABULOUS Stamp Share. This is one of those easel cards. I had seen them around other blogs and at SplitCoastStampers but I never tried one. I think I felt a bit intimidated by it. But it really wasn't bad to make at all. I couldn't locate my card so I went on Sues blog and copied her photo of the card (with permission of course). The bunny is from the "Occasions Mini Catalog." It's called "Chocolate Bunny." It's such a cute image. The paper we uses was Very Vanilla, Pretty in Pink and the Specialty Designer Series Paper "sending Love Specialty". 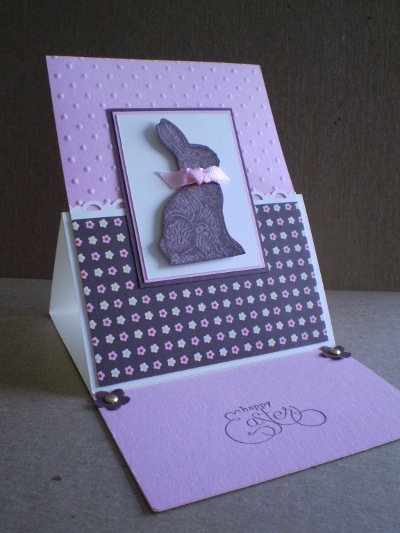 The Pretty In Pink paper was dry embossed with the Dotted Swiss folder. And the words came from the "Well Scripted" set. I have used that set a lot lately in my card making! I just LOVE the font! I hope you all are having a nice Easter. We are having our son and his girlfriend over for dinner. On April Fools Day he sent me an email telling me he proposed to his girlfriend and she was SO happy and excited. I emailed him back with a "congratulations" and an "it's about time!" I asked if they set a date and that is when he said it was "April Fools." I told him that wasn't very nice and he said it was "her" idea. So one of them is getting strangled! Not to sure if it will be before dinner or after! LOL We keep waiting for him to propose to her. I have no idea why he's dragging his feet. But I know, it's all in his own time. Wanda, I love all of the cards that you make, well everything you make! But I have to ask....what do you do with all of the cards you make? And do you ever make like 5 of one card so you have a "pack or stack" that you could sell. Thank you for taking time to read this. Beautiful card, Wanda. I made my first easel card last December and have been wanting to make another. This is a very pretty card! Love the colors and the pattern. Great card and design! I need to try an easel card, and am wondering how you mail them? 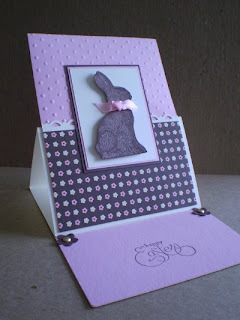 This is REALLY cute, I love making this style of card and they look so wonderful. Yes, Another Get Well Card! Ann & Leah Do it Again!